One doesn't have to look too deeply into the effect of the African diaspora on music to start hearing about noise and distortion. The earliest musicians among the pygmy tribes had various ways of making parts of their instruments buzz and hum sympathetically, sounds that American musicians emulated by turning up their guitars, sticking a pencil in the speaker, or stepping on a distortion pedal. Of course, that was centuries after European culture attempted to eliminate noise from music. I may have first read about the connection between say, Link Wray's Rumble and Ghanian sounds in African Music, the essential text by the late Francis Bebey. But not even Bebey probed into why this might be, why humans seem attracted to scratchy buzzy sounds. 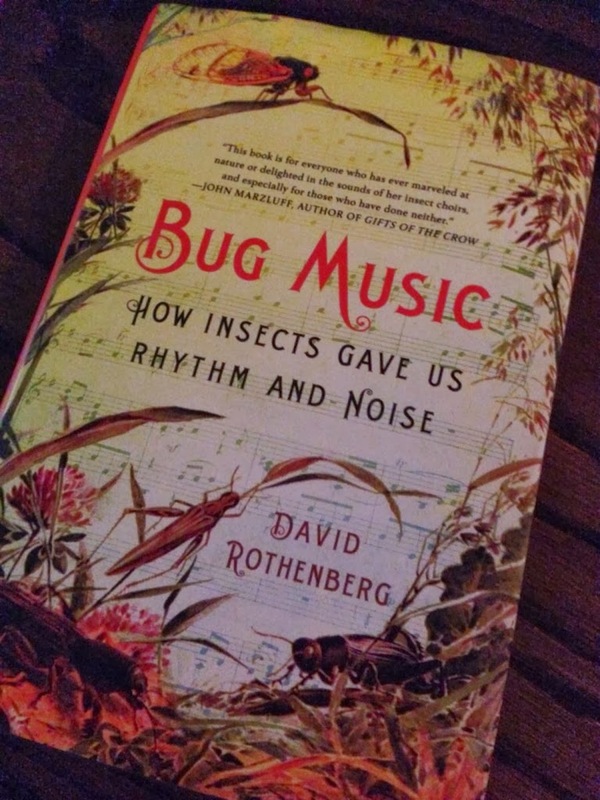 In his hugely entertaining and deeply thoughtful Bug Music: How Insects Gave Us Rhythm And Noise, David Rothenberg makes a bold attempt to figure it all out, and much else besides. 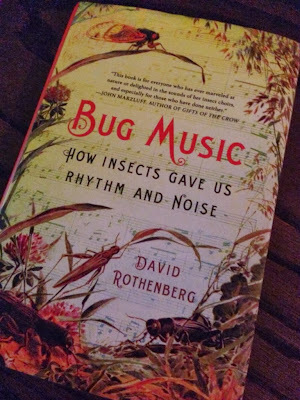 One big surprise in reading Bug Music is to learn that this hardly the first writing about the intersection between the music of arthropods and humans. Rothenberg's bibliography includes books dating back nearly 100 years and among the many poems he quotes is one by Anacreon from the first century B.C. However, this is probably the first time a musician has led the charge. Rothenberg plays sax with cicadas, speaks knowledgeably about music of all genres and eras - from Desprez to Deadmau5 - and has even provided a soundtrack to the book in the form of original music and a playlist of insect-influenced sounds. "Going along with the beat, but not quite on the beat. Don't mean a thing if it ain't got that swing. The perfect appeal of uneven evenness. Nature not Platonic but just slightly off. We find our way into reality by delving deep into the buzz, by charting the noise, mapping the chaos. Our world is not perfect, and was never meant to be. Once we recognize that, hear music in the fuzziness, only then are we halfway home." This leads to a brief overview of grooves and polyrhythms and then to the work of primate specialist Björn Merker, who has pointed out that the species that shares 99 percent of our genes (the ape) shows little interest in making music, dancing to rhythms, or joining together in synchronized activities. We obviously do, and such things have likely contributed to our success on the earth, so where did it come from? A strong possibility is the insects, who, after all, have led the way in the development of societies. So while entrenched devoteés of European music may bemoan the buzzing, noisy beat music that has taken over the world, there is likely no stopping it. They should let an enthusiast like Rothenberg show them the way. Reading this delightful, inspiring book will not only give you a new appreciation for the sounds of a summer night, but also a deeper understanding of the sounds on the radio - tune in. P.S. : You can find Bug Music: The CD on Spotify and I also created a playlist of many of the songs he talks about, along with a couple of my own additions. Out Of The Past 2013: Reissues, Etc. You don't have to be an industry pundit to know that the music business is in transition (if you're an optimist) or in deep trouble (pessimist). Whatever the case, and whatever the motivation, record companies have grown more and more adept at creating objects of desire in the form of super-deluxe box sets. A-list critics must be drowning in gorgeously produced limited editions, filled with smart liner notes, unseen photos and unreleased music. For those of us who pay for most of their music, many of these items are out of reach, although we can dip a toe in on Spotify and other streaming services. 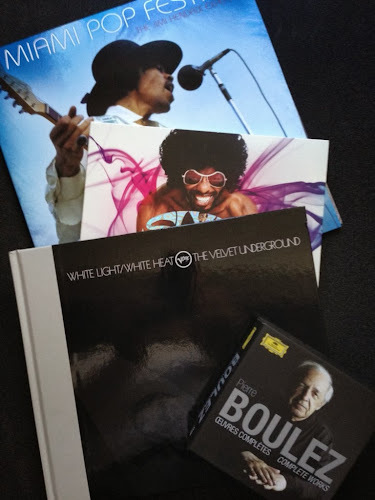 So I will not be going in depth about the latest Bob Dylan Bootleg Series entry ($96), Harry Nilsson's Complete RCA albums ($86), The Band live at The Academy of Music ($76), Skydog, the comprehensive Duane Allman anthology ($85), or volume one of Jack White's exhumation of Paramount Records ($500). I will say that what I've heard of these has ranged from illuminating to revelatory and some of them may yet find a home in my collection. The Beatles were also on sale again, with a new volume of BBC recordings. Let's just say that I'm on an accelerated schedule when it comes to that material and if you like the Fabs you'll want to grab what I am sure is a beautifully executed selection. Here are the catalog items I did spend time with, some of which have been overlooked as 2013 ground to a halt. Later, I'll let you in on a secret source of free (and legal) MP3's, which is one way I've kept up. Bobby Whitlock - Where There's A Will There's A Way: The ABC-Dunhill Recordings Bobby is an ace keyboard player and singer who took a back seat to Duane Allman and Eric Clapton in Derek & The Dominoes but who provided a jolt of energy and passion to the legendary proceedings. This fantastic set from Light In The Attic compiles his first two solo albums and is a blast of 70's goodness. The cast is beyond star-studded (George Harrison, Clapton, Klaus Voorman, Jim Gordon, even the Edwin Hawkins Singers) and the music combines blues, folk, country and soul in a way that will be familiar to fans of Layla, All Things Must Pass and Dave Mason's Alone Together, and many of the songs can hold their own in that illustrious company. Some reviews of this reissue have come down on Bobby for being emotionally profligate - he doesn't hold back - but to me he just sings as though there's something very real at stake and I believe every growling syllable. Michael Chapman - Wrecked Again Like the above, this is another public service from Light In The Attic and their third Chapman reissue. A genius acoustic guitarist whose voice might be an acquired taste, Chapman's early stuff has interesting overlaps with pre-Ziggy Bowie. On Wrecked Again, he broadened the palette significantly, working with Space Oddity arranger Paul Buckmaster on several songs. When the strings and horns swooped in on the title track, I was admittedly surprised, even though I knew they were coming. However, repeated listens caused everything to gel beautifully. On that song, the orchestration serves as a hedge against Chapman's self-lacerating refrain "Oh, Michael, what have you done," while an epic like Fennario is just made more so thanks to Buckmaster. if you like you folk-rock acerbic and British, get Wrecked Again with Michael Chapman. The Velvet Underground - White Light/White Heat 45th Anniversary Super Deluxe Edition Coming out around the time of Lou Reed's death, this lavish and deep reissue was another reminder of why we all cared so much. The Velvets come on like a supercharged rhythm & blues band on the third disc, which features a complete concert taped on East 71st street a few months before they recorded the album. In a flash I understood why The Yardbirds were the first group to cover a VU song. And then, as Sister Ray seemed to condense into a black hole of musique concrete, it was hard to imagine the two bands were even from the same planet. The remastering is perfect, the visuals gorgeous, and the essays, featuring new insights from Reed, John Cale and Moe Tucker, make for great reading. "No one listened to it," Reed said, "But there it is, forever - the quintessence of articulate punk. And no one goes near it." A landmark reissue. Pierre Boulez - Oeuvres Completes - Complete Works Sometimes sparkling, sometimes challenging, always rewarding, the music of Boulez is essential listening. This collection, drawn from several labels and cheekily subtitled "Work In Progress," features pretty much everything the 88 year old composer is satisfied with at this point. Sly & The Family Stone - Higher A long time coming and very nearly gives the full measure of the man and band. Elvis Presley - Elvis At Stax After listening to this thorough investigation of the music Elvis recorded at Stax in 1973, I am more convinced than ever that calling him the King Of Rock & Roll does him a disservice. It's far too limiting - he's more like the king of American song. Comprising funk, folk, pop, balladry and rock & roll, when assembled together, these sessions prove that Elvis was at a peak of talent and engagement. Some of the alternate takes are superior to the released versions, with Elvis cruising to victory over his crack band. Note that it is his band and not Booker T. & The MG's - he wasn't THAT adventurous. These sessions were his last sustained work in the studio in his legendary career and, while not all the material is top-notch, Elvis At Stax is further proof that when given his head, there was no one better. The Miles Davis Quintet - Live In Europe 1969: The Bootleg Series Vol. 2 Speaking of giants of American music, Sony Legacy follows up Vol. 1 with another spectacular release. Worth it just for the DVD of this short-lived band onstage. Rodion G.A. - Lost Tapes This Strut compilation features the wild and wonderful (and occasionally wayward) music Rodion Rosca recorded between 1978 and 1983, never before released sounds of young electronic Romania. Think you've heard it all? You're so wrong. Killing Joke - The Singles Collection 1979-2012 Even if you can't find the three disc version (with demos and rare tracks), this overview of the unstoppable post-punk band is fairly definitive. For now. Buffalo Daughter - Rediscover. Best. Re-Recordings And Remixes Everyone knows the 90's are back, so what better time to delve into the witty and Krautrock-infused sounds of this Japanese trio? First heard on these shores via the Beastie Boys's Grand Royal label, this collection will bring you up to speed on some really fun stuff. Finally, a word about Jimi Hendrix. While I wish his half-sister Janie seemed to be a nicer person, there is no doubt that she helped last year be a banner year for the ultimate guitar hero. People, Hell & Angels collected a dozen studio tracks Hendrix recorded at various times and places without the Experience. While some of the remastering is slightly aggressive, the songs burst out of the speakers, crackling with fire and life. If this is indeed the last new release of unreleased Hendrix studio material, it's a more than worthy ending point. 2013 also saw the release of Hear My Train a Coming, a lovingly produced documentary made in collaboration between the Hendrix family and PBS's American Masters. Featuring spectacular live footage and a wealth of new interviews, it's hard to imagine bettering this film. Show it to anyone who doesn't understand - and even those who think they do. The DVD has some great bonus features, including footage filmed at the New York Pop Festival and the Love & Peace Festival in Germany - his last ever performance. There's also a generous selection from the Miami Pop Festival, which is also the subject of its own release including a complete set from the 1968 concert. The Experience burn their way through a mostly standard setlist, heavy on Are You Experienced? material. However, there was rarely anything standard about a Hendrix concert and there are many inspired and transcendent moments. Make sure you watch this performance of Foxey Lady all the way to the end. Hendrix dishes out a number of dazzling effects to finish off the song - scraping the strings, abusing the whammy bar, swinging the guitar against the mic stand, and pounding the strings with his fist. His expression of wicked delight is something to see and a perfect capper to a great year in reissues. Out Of The Past 2013: Reissues, Etc. from Murgatroyd on 8tracks Radio. Now, about those free MP3's…Do you have a library card? Then you are entitled to access Freegal Music and download three tracks each week. Is there more than one library card in your household? Do the math - and tell them AnEarful sent you.